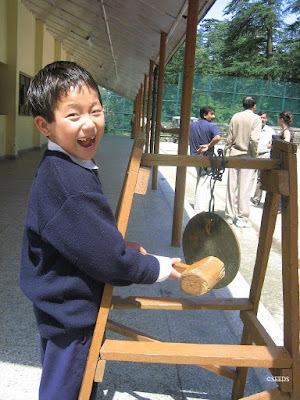 The gong is ringing. It takes you back to break time, to your favourite class, to a teacher, to the smell of chalk (or markers), to your school. For a school is more than a building. Its importance as a child’s foundation, as an institution that holds weight and as a refuge in emergencies is unparalleled. Along with hospitals and key public administration buildings, they are seen as ‘lifeline’ structures in a community. So it seems a given that schools should be ‘safe’, but safe how and from what? Actual perceptions of risk and safety differ widely based on experience. Yet, what happens when you live in a high seismic zone that has never seen a major earthquake in your lifetime, or a highly flood prone area which mainly stays dry? What happens when the school is a fortress but children are unable to get around since it is not disabled-friendly? What if a school barely has the resources to teach the curriculum, let alone do anything extra? What if children are safe within the school walls, but face inordinate risks getting to and from school? What if daily life is such a struggle that disasters are not on the radar? Would your perception of safety change? A recent participatory assessment study carried out by SEEDS in East Delhi illustrated some of these nuances. The technically high potential hazards (earthquakes, floods, fires in that area) were not recognised as actual priority concerns by parents, teachers and officials. Instead, road accidents, eve-teasing and bullying were most feared as grave risks. Considering that the majority of children in that area walk to school, mostly unaccompanied, these fears were amplified further. The lack of basic awareness, even around specific disaster help lines, and the poor involvement level of parents in school safety affairs were startling. Integrating varied perceptions of risk into the approach is required to bridge this gap, putting children at the centre rather than just the school. For ultimately, school safety initiatives aren’t meant to just create a safer environment at school. School Disaster Management Plans, encouraged as part of the National School Safety Policy Guidelines, for example, is a process that is meant to be inclusive of the broader community. The schools become the fulcrum for larger resilience transformations in the community. So on the one hand, there needs to be a broader recognition of day-to-day risks, such as the health of children that results in school absences. This is often linked to civic issues which can help engage parents and the surrounding communities. With emerging challenges, the journey to and from school, and a growing focus on child protection issues will also be critical - from better security measures to addressing psychosocial problems. On the other hand, there is a need to drive home the criticality of preparedness and disaster risk reduction. Just because it has not happened in recent recall, it does not mean a disaster won’t strike. Part of this is about the school buildings which often suffer from serious structural flaws and falling hazards that make them increasingly vulnerable. The other part is about spreading awareness and building capacity. Ideally, these can adopt complementary approaches, though much work still needs to be done on interpreting disaster reduction through mainline subjects. Such training needs to provide a balance between the theoretical and the practical. There is no use in simply learning the history of cyclones in the region if one doesn’t know to not take shelter under a tree when a cyclone strikes. Or stating the chemical composition of a fire when unable to operate a fire extinguisher. The clearly perceivable impacts of climate change means that the frequency and fury of such disasters will only grow and the vulnerability of children rise. At the same time, day-to-day risks undermine development gains and livelihood options, badly affecting children’s education. Ultimately, none of these risks should be viewed in isolation if children are to be made safer. For the gong is ringing now. 'How safe are our kids? Honeywell Safe Schools Baseline Summary Report'. The study helped identify 50 priority schools in East Delhi for safety interventions. National Disaster Management Guidelines – School Safety Policy -February 2016. A publication of the National Disaster Management Authority, Government of India.